Aunty, with our prospects in life — what's the point of being healthy? The major factors causing poor health across the Australian community, particularly in Indigenous mental and rural health, are poverty and inequality — not the lack of hospitals, argues John Menadue. “Thank you, Mr. Menadue, for what you are trying to do to help Indigenous people , but when I speak to young men in my mob about the importance of health, they say to me 'Aunty, with our prospects in life, what is the point of being healthy?'" In my view, the reason why Aborigines have worse health than the non-Indigenous population is because of inequality. … Isn’t health a matter of personal responsibility? If people fail to heed advice about smoking and healthy lifestyle, they have no one to blame but themselves. I invite you to go into a deprived community in Sydney or Melbourne, let alone the fringes of a benighted country town and start lecturing people about healthy eating. To put it politely, you would be given short shrift. It is not ignorance of the health consequences that lead to unhealthy behaviour. Making ends meet, avoiding violence and other crime all take priority. People are not responsible for the social forces in their life. Get the social conditions right… and then of course people can be expected to take responsibility for their own health. Many ministers in the "health" field would be better described as ministers for hospitals. This is particularly true of many state "health" ministers. These ministers focus almost exclusively on hospitals and the media does exactly the same. Ministers love iconic hospitals. They are great opportunities for public announcements about an expansion or laying a new foundation stone. An objective of good "health" policy would be to reduce the focus on hospitals and beds by building healthcare in the community and the home. Unfortunately, acute and urgent care in hospitals, displaces the important and money and effort is focused on hospitals and beds . This is a particular problem in Australia because of divided responsibilities in health — the states run the hospitals and the federal government provides most of the money for community care. Until we address the dysfunction that arises because of different funding streams, we will continue to have major problems. Our emergency departments in state public hospitals are under great pressure in part because of the collapse of federally funded general practice in unsociable hours. There are numerous ways in which health is affected significantly by what happens in portfolios beyond that of the Minister for Health. There is little consideration of "joined up government" to address many health issues. The real and basic problems that cause bad health are largely ignored. The social determinants of health have a major impact on health. The evidence is clear. Professor Fran Baum in The Conversation (September 1, 2016) drew attention to the social consequences of inequality. Sharon Friel also in The Conversation on 1 September 2016 points to the way that class and wealth affect health in the community. She shows that poor people have much worse health outcomes than rich people. See table below. Fourth, many of the factors that dramatically affect health outcomes depend on action outside the health portfolio. Unfortunately, most "health" ministers are really ministers for hospitals or health services — and not ministers for health. Poverty and inequality are the major factors causing poor health across the Australian community and particularly in Indigenous mental and rural health. We apply band aids in our highly medicalised model of care. We deal with the symptoms, not the cause. Unless we focus on these issues, we will continue to be left with the question raised with me by Indigenous people and others who say “With our prospects in life, what is the point of being healthy?” That is what the social determinants of health are all about. This article was originally published on John Menadue's blog 'Pearls and Irritations' on 14 September 2016. You can follow John on Twitter @johnmenadue. 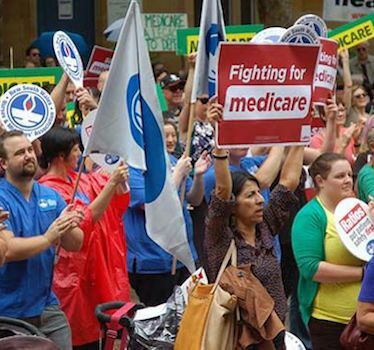 Privatise Medicare? Of course not...dismantle it, weaken i bit by bit. Stay informed. Subscribe to IA for just $5.